WD30EFRX WD Red hard drives are designed and tested for compatibility in the unique 24x7 operating environment and demanding system requirements of home and small office NAS. Built in NASware optimises power use resulting in significant power savings and lower hard drive operating temperatures. 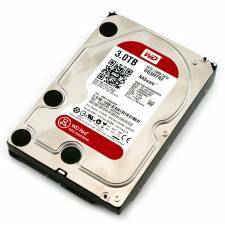 This improves the overall reliability and performance of the drive and reduces the NAS cost of ownership. The right choice! - No other drive is designed specifically for home and small office NAS systems. Exclusive NASware technology - Our exclusive technology, NASwareT, makes WD Red thrive in the demanding small-NAS environment. Energy efficient and money saving - We keep power consumption low which keeps your NAS system happy and your wallet, too. NAS compatibility - NASware - Advanced firmware technology built into every WD Red drive, enables seamless integration, robust data protection and optimal performance for systems operating in NAS and RAID environments. Enhanced reliability - Your NAS systems is always on, a highly reliable drive is essential. With a 35% MTBF improvement over standard desktop drives, the WD Red drive is designed and manufactured to be a more reliable and robust solution. Premium support - Exclusively for WD Red drive customers, our free dedicated 24/7 support line is available in English. Other regional support hours vary. Ideal for - Specifically designed and tested for small office and home office, 1-5 bay NAS systems.